Not a hoax! Not an imaginary story! Writer Dan Slott is finally bringing Peter Parker back to the Marvel universe this April and putting him back inside his own body as god/Stan Lee and Jack Kirby intended. The days of the Superior Spider-Man are numbered — but Peter's resurrection isn't coming without a price. However, the question on everyone's mind has not been the "when", but the "how" Peter Parker returns from the dead and Slott is quick to tease just that. "In a strange and terrifying way. And... possibly... at a very great cost. Remember, nothing is ever easy for Peter Parker. It's one of the reasons he's a true hero," says Slott. 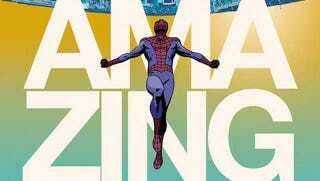 Peter will return in The Amazing Spider-Man #1, due out this April. I'm curious to know what's happening to Doc Ock's consciousness... if it's actually going anywhere at all. I can easily see Doc Ock sticking around Peter's head for a while, playing the role of the world's crappiest conscience.